Another year older. Once again, my baby chubbyness in all it's glory!. 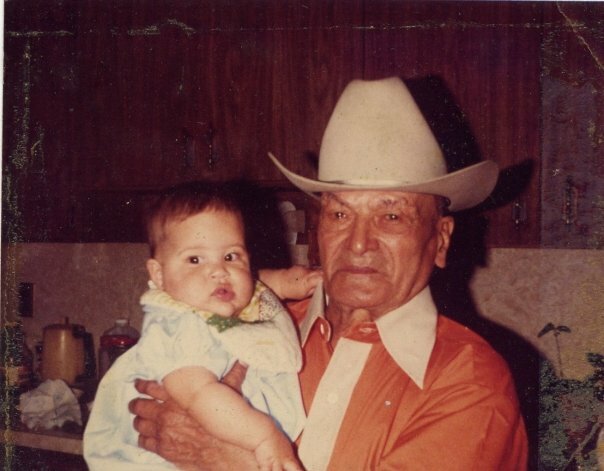 My poor grandpa ("Popi") holding me, he's prob like "Aye Dios Mio!" and How much do you LOVE the cowboy hat! That man was classic. Another year wiser? 10 years ago I turned 18. I was dating my fiance, in my senior year of HS, and had no idea what I wanted to do. So much can happen in a decade it's incredible. I am so blessed with those around me, my family, my Fiance, and wonderful friends! I have a new year ahead of me with some pretty phenominal events… I think it's going to be a good year. Happy Birthday!!!!!!! Have a great day!!!! Happy anniversary! It’s my anniversary too. HAPPY BIRTHDAY! 30 should always be celebrated, but you simply MUST celebrate yours with a wild do! Happy Birthday, SFAM! It’s going to be a fanfreakingtastic year! xo-S. Happy Birthday! (Mine’s next Saturday – the 18th) I’ve always called your blog TENTenknits – like saying TENT-un-knits. NOW I know it’s TEN TEN knits. How ’bout that. By the way, your 30th birthday? That is SO cool. I’m a math teacher so weird number things amuse me to no end. Happy birthday my friend! Thanks for all the laughs this year! Here’s to twenty twenty knits!!!! How cute are you and your grandpa? Happy, happy birthday. Happy Birthday! Mine is tomorrow, the 13th. It’s nice to meet another Libra. ps: Well, someone will be happy to know about the ‘chubbiness’ since he, Wiggley, is chubby 🙂 Cute, no doubt! happy birthday. have a wonderful year! A belated happy birthday to you – hope it was great! Here I am, a week later, to say that I hope you had a great day and that your Popi was a serious style icon–love this picture! !